C oncrete products are manufac‐ tured to last almost forever. So why discard the sturdy material just because the useful life of a concrete building or highway has ended? 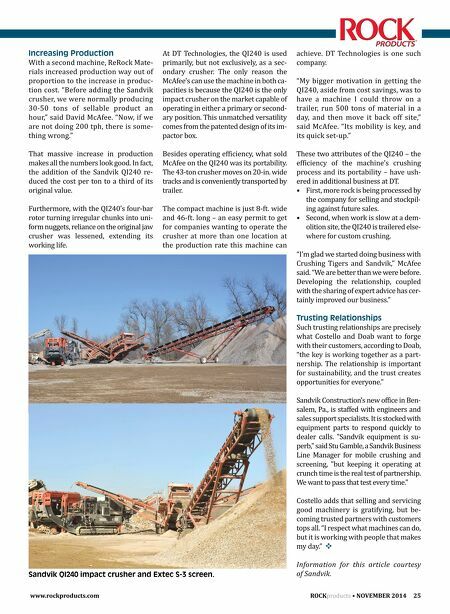 Landfilling old concrete suddenly did‐ n't make sense to Terry McAfee and son David: They are on a mission to recycle concrete, and Sandvik equip‐ ment is helping them. The McAfees own and operate DT Spe‐ cialized Services Inc. from their Tulsa, Okla., headquarters, and it is from here that they manage demolition projects across the lower midwestern United States. Five years ago, the men, while tearing down a concrete structure, de‐ cided that the project created an unusu‐ ally large pile of refuse material and the McAfee's were uncomfortable with haul‐ ing it all away to a landfill. "We realized the sheer volume of con‐ crete debris we created was going to be wasted, rather than recycled. That was the cornerstone of our decision to start the crushing business," said Terry McAfee. The result is an affiliated com‐ pany called ReRock Materials Inc., which creates recycled concrete and ag‐ gregate products. 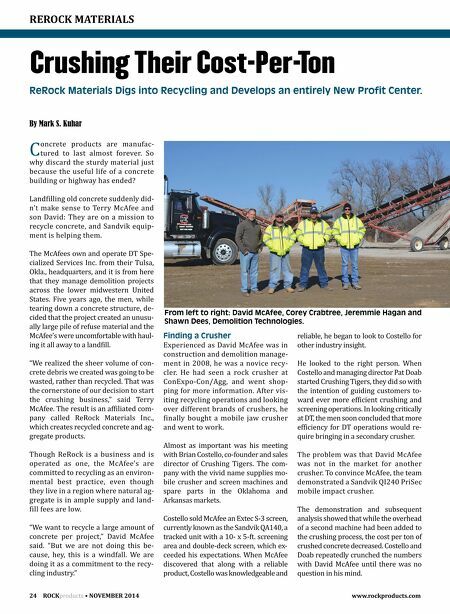 Though ReRock is a business and is operated as one, the McAfee's are committed to recycling as an environ‐ mental best practice, even though they live in a region where natural ag‐ gregate is in ample supply and land‐ fill fees are low. "We want to recycle a large amount of concrete per project," David McAfee said. "But we are not doing this be‐ cause, hey, this is a windfall. We are doing it as a commitment to the recy‐ cling industry." Finding a Crusher Experienced as David McAfee was in construction and demolition manage‐ ment in 2008, he was a novice recy‐ cler. He had seen a rock crusher at ConExpo‐Con/Agg, and went shop‐ ping for more information. After vis‐ iting recycling operations and looking over different brands of crushers, he finally bought a mobile jaw crusher and went to work. Almost as important was his meeting with Brian Costello, co‐founder and sales director of Crushing Tigers. The com‐ pany with the vivid name supplies mo‐ bile crusher and screen machines and spare parts in the Oklahoma and Arkansas markets. Costello sold McAfee an Extec S‐3 screen, currently known as the Sandvik QA140, a tracked unit with a 10‐ x 5‐ft. screening area and double‐deck screen, which ex‐ ceeded his expectations. When McAfee discovered that along with a reliable product, Costello was knowledgeable and reliable, he began to look to Costello for other industry insight. He looked to the right person. When Costello and managing director Pat Doab started Crushing Tigers, they did so with the intention of guiding customers to‐ ward ever more efficient crushing and screening operations. In looking critically at DT, the men soon concluded that more efficiency for DT operations would re‐ quire bringing in a secondary crusher. The problem was that David McAfee was not in the market for another crusher. To convince McAfee, the team demonstrated a Sandvik QI240 PriSec mobile impact crusher. The demonstration and subsequent analysis showed that while the overhead of a second machine had been added to the crushing process, the cost per ton of crushed concrete decreased. Costello and Doab repeatedly crunched the numbers with David McAfee until there was no question in his mind. REROCK MATERIALS ROCK products • NOVEMBER 2014 www.rockproducts.com 24 Crushing Their Cost-Per-Ton By Mark S. Kuhar ReRock Materials Digs into Recycling and Develops an entirely New Proft Center. From left to right: David McAfee, Corey Crabtree, Jeremmie Hagan and Shawn Dees, Demolition Technologies.